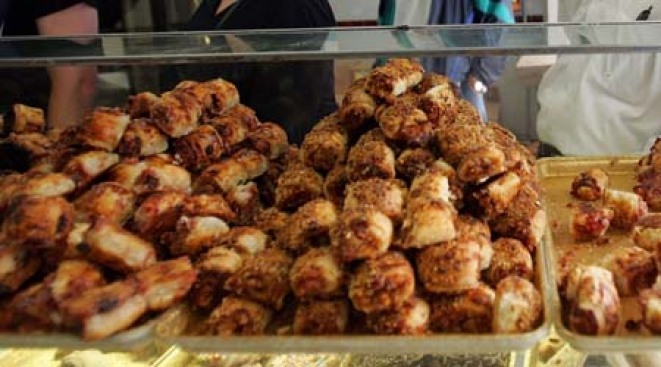 Sample rugelach and much more on Sunday's Brooklyn Kosher Combo Noshwalk. MATZOH FAST: Once you've gone on the Kosher Combo Noshwalk, your bragging rights to some of the more obscure foodie finds of far-flung Brooklyn (like Midwood) will be secured. Also, you'll be stuffed to the gills with kosher treats. 1PM. SHOP RITE: Pinch your pennies and do some good to fight AIDS and homelessness at the last day of the (Marc Jacobs-chaired) Housing Works Fashion for Action sample sale at their Chelsea shop, where you can score designer duds up to 80 percent off. 11AM-7PM; our fuller coverage here. BRING THE HEAT: Grease your hair and come on down to the Blender Theater where the good Rev. Horton Heat - the only act we get to use the word "punkabilly" in describing - will blow the roof off the building, per the band's well-established reputation. 8PM.